Reader Megan Huylo’s contest winning recipe! 1. Preheat oven to 425 degrees. Place the beets in a baking dish with 1″ water, cover with foil, and roast, about 45-60 minutes, or until fork tender. 2. While the beets are roasting, heat 1 tablespoon olive oil over medium-high heat in a medium pot. Add the shallot and a pinch or two of salt and sauté, about 3-4 minutes, until translucent and fragrant. Add a teaspoon salt, amaranth, shiitakes, kombu, and 3 cups water. Bring to a boil, reduce to simmer, and cook about 30 minutes until the water is absorbed and the amaranth is the consistency of polenta. Stir in the cashew butter, lower heat to low, and keep warm. 3. When the beets are done, whisk together the lemon and ginger juices, zest, maple syrup, pumpkinseed oil, and a pinch or two of salt. Wrap each beet individually in a clean kitchen towel and rub gently to remove the skin. Slice into wedges and add to the bowl with the lemon and ginger mixture. Toss to coat and set aside to marinate. 4. Toss the asparagus with a tablespoon of olive oil, a pinch or two of salt and pepper and spread out on a large roasting sheet. Pop in the oven and roast, about 10 minutes until just tender and lightly browned. 5. 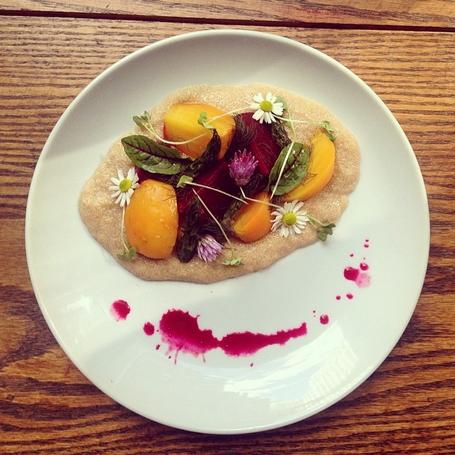 Divide the amaranth between 2 plates and top with the marinated beets and roasted asparagus. Toss the sorrel leaves and bronze fennel fronds in the remaining marinade and sprinkle over top the vegetables.